I just turned 21, as you can probably tell from some of the gifts I got, and I thought I would show you what my family got me for my birthday! First, My sister got me the shaker and muddler, See Mix Drink, and the booze tea cup. I love them! I like the set up of the book, it gives you visuals of how much of each ingredient is in the drink to give you a visual aid of how much you are drinking, as well as the calories of every drink which is good because alcoholic drinks can add up! There was an obvious theme with these gifts! Now for what my parents got me. The only things I wanted for my birthday was the naked 3 palette and the Hawaiian floral vans that I got. I think I’m the last makeup fanatic to get there hands on the naked 3 palette. I was so content with my naked 1 that I didn’t feel the need to spend the money on the 3rd one. 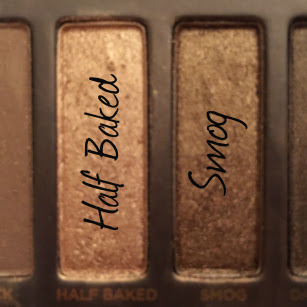 It was now time to branch out to the naked 3 palette. The pinky tones are perfect or spring and summer. I’m definitely going to be using this all summer long. I found these vans one day when I was browsing some websites and thought they’d be the perfect summer accessory. I keep my wardrobe pretty basic and these are a good statement piece. Next, I got Steve Madden Noble Block Sandals. I was admiring them at Macy’s a few days before my birthday and my mom ended up getting them for me. It was a nice surprise! Lastly, I got a Bose color Soundlink. I am moving into an apartment for my last year of college and this will be perfect for when people come over (and when I listen to music in the shower). That’s all for today. What’s one your birthday list? Tell me in the comments. One of my goals for this summer is to work on getting healthier. I would like to lose some weight and generally be in better shape.I thought I would get some healthy snacks in my pantry. I’m sure most of you have heard of Nature Box before, their ads are all over Facebook. Nature Box has a promotion where you can get a free trial of the subscription and you only have to pay $2 shipping. In the box you get 1 full size snack and 5 one serving snacks. My full size snack was the dark chocolate nom noms and my 4 smaller snacks were Sweet blueberry almonds, masa chips, jalapeño cashews, and cranberry medley. These are delicious! they taste like balls of brownie batter, the chocolate flavor is so rich! These little balls are the perfect snack to have when your sweet tooth rears its ugly head. They curb your sweet tooth and only have about 8 grams of sugar in each piece which makes them a perfect snack for staying on track. These weren’t my favorite but I also don’t like corn chips very much. I thought they were quite heavy and weighed down with oil. I know flaxseeds are supposed to be good for you but I personally don’t like the taste that much. Overall, I probably wouldn’t repurchase these but if you like corn chips you might want to give these a shot. These are exactly what you think they are, flavored dried cranberries. They’re basically just craisins, I don’t think they are any better or worse for you. Although I do love craisins I got this box to try new snacks that I’ve never thought of before so it was a little disappointing that one of the items I got could be bought at any grocery store. Everyone that knows me knows that I love anything spicy! So naturally I loved these. they were just the right about of spicy without being too much. I would definitely order these in another box. I was not a fan of these. They say on all the packaging that they don’t use any artificial flavoring but to me these almonds taste like they have been dipped in blueberry koolaid powder, if that flavor exists. I wouldn’t repurchase this snack. Overall, I thought the box was okay but I think the subscription has more potential than what I got in my trial. My favorite snack was the dark chocolate nom noms, which I can easily see myself becoming addicted to. I think this trial is a good way to get a feel for what the company is giving you every month and each trial box gets different snacks so you could get the same snacks as me or different ones. Each regular box has 5 full size snacks that you can choose from their online store. I’m going to keep my subscription at least until my next box comes to see if I like the snacks that I pick better than the ones I was given. If you want to hear more about the full size box leave a comment below and I’ll do an unboxing/review on that box. Also, if you’ve tried Nature Box tell me what snacks you liked best! shadow I love using gold and bronze eye shadows because they create a more natural look and complement most eye colors. I have green eyes and gold eye shadow really makes them pop! It also is a nice break from the dark colors I usually wear during the fall and winter months. 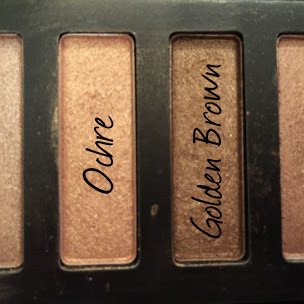 My favorite gold eye shadow combinations are half baked and smog from the Urban Decay Naked 1 palette and ochre and golden brown from the collection eyes uncovered palette. The collection palette is a great dupe for the naked palette, as you can see Smog and Golden Brown are very similar.